This chart displays characters from Victor Hugo’s novel Les Misérables. Each rectangle represents a character, color-coded by their character group. 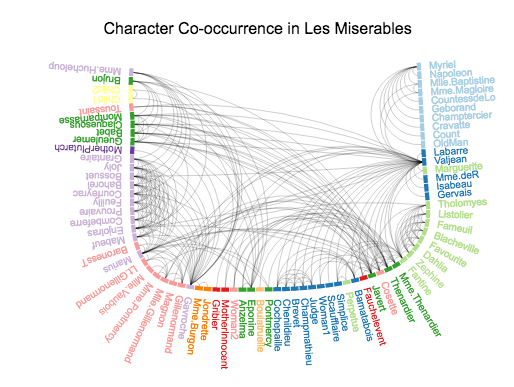 Arcs are drawn to represent co-occurrence relationships between characters. Original dataset compiled by Donald Knuth for the Stanford GraphBase; retrieved from Mike Bostock’s D3 example Force-Directed Graph.